Is parenting harder than a job? 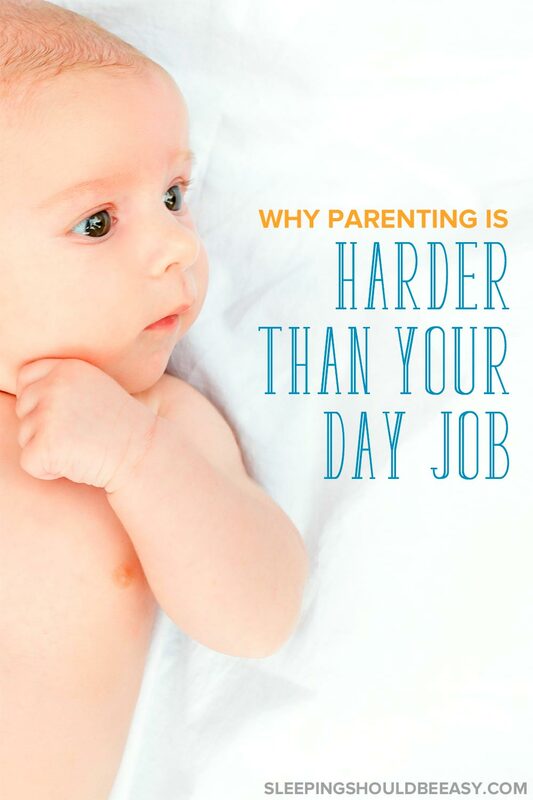 Read several reasons being a parent is often harder than your day job, no matter your career. I had always believed taking care of kids is not for the faint of heart. I read statistics in the past that claimed a stay-at-home parent’s salary, if paid, would be worth at least $100,000. Such is the testament of the work and dedication we put into this job. I agree—taking care of kids has been harder than my own day job. Yes, I have perks—during maternity leave, I got to nap or veg out when the kids did. I didn’t get ready, pack a lunch or drive anywhere. And I could run errands and tend to whatever tasks I needed to do. Plus I’m free to have fun with my kids. Is parenting harder than a job? But let’s be honest. I take some days off here and there to hang out with my kids at home, and I am exhausted by the end of the day, more so than when I go to work. Weekends are equally tiring, even with my husband home. Taking care of my kids has always felt much harder than my day job. While I get more exercise this way, caring for kids is more exhausting than my day job. I sit at a desk all day, so I don’t do much heavy lifting or carrying the way I do when I tote my babies around or push their gigantic stroller everywhere. I’m playing games, chasing after my kids and otherwise are on my feet more often with them than at work. This doesn’t even count getting smacked in the face from an unintended elbow or sleeping in two-hour increments at night. My day job isn’t stressful. It’s got the right balance of drive without feeling drained. Especially compared to following through with consequences or trying not to get upset when the baby won’t nap. Dealing with irritating coworkers is nothing compared to staying calm in the middle of a tantrum. It seems I’m not alone, either. A study found that women feel more stressed at home than at work. Perhaps a finding not too shocking to many working moms. At work, I’m able to enter “flow,” a term coined by psychologist Mihaly Csikszentmihalyi (pronounced “cheeks sent me high”). 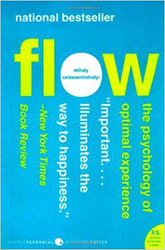 In his book Flow: The Psychology of Optimal Experience, he describes flow as when people are so absorbed and concentrated on a project that time flies by. He credits this focus as one of the tenets of happiness: Do concentrated work, and you will leave feeling fulfilled and challenged. The catch? It takes time to enter this flow. Uninterrupted time. Yeah… not gonna happen with kids in tow. I don’t know what I hate more—when the kids are sick, or when I am (I’m not even going to think about when we’re all sick… shudder). But those times when I’m the one unwell are some of the hardest days. As much as the kids understand I don’t feel well, they still need me to tend to their needs. I can’t just tell them to cook their own meals or put themselves to sleep for the night. Just as your body is yearning to rest in bed, the kids need a diaper changed or a snack on the table. Read tips about caring for a sick child. For many working moms, our jobs end once we leave the premises. Sure, we might check email at night or even bring some work home, but there’s a definite time when work ends. We work round the clock, 24/7. If your child needs you in the middle of the night, you get up. Very few jobs need you to do the same. Forget weekends—I look forward to Mondays after a tiring weekend with no one to pass the kids off to. At my day job, I know exactly when I’m done and can shut my mind off. But parenting means you’re always on call. Nothing can prepare you completely for parenting. Even if you worked with kids, or have been a nanny, or even cared for a newborn at nights. Not until you become the parent do you then experience what it’s like to be one. In other jobs, you can dabble and dip your toe in the industry. You might intern for a company or start working while in college. And while the first day at your first “real” job felt overwhelming, you eventually caught on, perhaps within a few weeks’ time. Ask any newborn mom how she’s doing and she’ll tell you it takes more than a few weeks to adjust. And even then, you still don’t feel like you have the hang of it. I’ll admit: I was one of those moms who Googled “I don’t like being a mom” in the middle of the night as I held my fussy baby, trying to soothe him to sleep. I felt desperate. Like all the preparation I made didn’t even come close to how overwhelmed I felt. How much harder it really was compared to what I imagined (and I imagined the worst). And perhaps the most daunting—that I couldn’t quit. Parenting isn’t a job you can turn your resignation in after a few months of realizing it’s hard. You stick with it. You have no choice but to. Even in the hardest of days, you plug on through. Struggling with putting your baby to sleep? Wish he could learn to self soothe and sleep on his own? Discover the 5 mistakes that are keeping your baby from self soothing! We may not get paid, hear feedback or receive training. Our days are more physically and mentally exhausting, often interrupted with little time to pursue our interests. We work round the clock, often even when we’re sick. And there’s the startling reminder—especially on those hard days—that we can’t just quit. That our kids need us, no matter how hard, how exhausting, how incompetent we may feel raising them. No day job I’ve ever had has drawn so much emotion and effort from me as being a parent has. Tell me in the comments: What’s your day job? Is it harder or easier than taking care of kids? I’m a lawyer…an in-house government lawyer, so relatively low-stress in the grand scheme of things… and I’d say, most days, my job is way lower stress than a day home with my 4 year old. Now, a day home with my magical unicorn baby? I’d take that over work any day. As a former journalist, I can attest to the fact that raising kids is WAY harder than anything I ever dealt with out in the field. I worked 17 hour days, back to back, standing at the front line of a fire, having no access to food, water, or bathroom…and that was still easier than staying at home with my toddler. I feel like your sentiments are spot on. For most people, at work, you get five minutes here and there to eat a sandwich, go to the bathroom, chat with a co-worker, etc. At home, you’re faced with a little person who thinks he is the center of the universe. And the feelings of isolation and boredom can be intense. There may be some super moms out there who would beg to differ but for me, I realized that I am a much better mommy when I’m working…it gives me the balance and fulfillment I didn’t find when I was a SAHM. Thanks for the insight! Wow Jen! I thought of you as I wrote this, thinking your days as a journalist *had* to be much more difficult than when you stayed home with your kiddo. But I guess I was wrong, even with all that madness you had to go through and the stress with your day job! I think the big difference is that, even though you had to deal with crisis after crisis and it was stressful, you still had those pockets that you mentioned. Five minutes to eat, to drink, talk. And most people you deal with aren’t as unpredictable as children. Daycare workers, childcare workers, and teachers have the hardest job in the world because it’s a job that I don’t think I could do. Maybe if I HAD to but definitely not a choice I’m making now. I am not only physically exhausted after a Sat. or Sun., I’m mentally exhausted. I don’t have to fight with my co-workers, negotiate with them about mealtimes, or answer their questions over and over and over again. They also don’t want me to make-up activities all the time or play the same thing all the time. Sure, like you said, other jobs are stressful and I wouldn’t want them either. Guess it’s where your passion is at right? Some would say they wouldn’t want my job doing research and sitting at the computer all day. Me, I love it :). I give much props to teachers. I know it’s not the same as at home and kids tend to save their worst tantrums for their parents, but still… they’re dealing with a ton of kids and need all the patience and physical stamina to keep up! And all that standing all day, eesh. Such an interesting discussion! I’ve always been some kind of office worker, so I definitely think that being a mom is harder than my day job. A few months ago I left to work part-time as a freelance writer, and while that has been very challenging mentally and emotionally, due to the large amount of self-marketing it requires, it still doesn’t compare to my job as mom! For me, being a mom is the toughest job, hands down. Thanks for chiming in, Katie, and offering us a perspective from a freelancer’s point of view. Like your previous job, mine is in an office and is markedly much easier than being at home. I love taking care of my kids but it’s exhausting for sure. I definitely need to recollect every night! Nina, I have a private practice as a child and family therapist and find caring for my kids way harder. I absolutely love my job. It’s challenging and rewarding. I am my own boss and make my own hours. So, while I am drained when I come home sometimes, it’s different than the fatigue of taking care of kids all day and especially all weekend. My husband is an attorney with a pretty stressful job but he will still agree with me 100%! All the points you made are right on! Haha so I guess I was wrong about my assumptions about lawyers too! You’re right Kim—it’s a different kind of exhausted. I think it’s because you have clear goals at work, and it feels good to cross things off, accomplish things. With kids we have such a vulnerability since we’re their parents. We sometimes take their outbursts personally, or we have a running list of things we have to do around the house. I get the concept of “flow” and its importance to happiness. My job as a marketing agency account supervisor and strategist was often very demanding. It required me to juggle many deadlines, a variety of client and colleague personalities and manage a variety of details throughout many projects and teams at once. I was good at it, but I found it incredibly stressful. Yet there was still time in a day to sit down and focus on a project, to make headway on something I was responsible for, and feel a sense of accomplishment and achievement. My kids are the most demanding clients and unreasonable bosses I’ve ever had the privilege to work with, and they don’t give me that time. Our best days are the rare days that I can carve out a quiet hour to write or research, things which I would get to do each day in an office. There are no congratulatory handshakes or promotion opportunities in motherhood, and some days that feels really disappointing. I am definitely one of those SAHMs who romanticizes the idea of peeing with the door closed or sitting through a whole meal, even if it is at a desk. Yup Lynn, you nailed one of the biggest reasons taking care of kids are tiring: they’re still kids and so we can’t always reason with them the way we could with our adult colleagues (even the most difficult ones). And that sense of accomplishing something is fantastic. I know we can achieve the same with kids, but I tend to think all the headway they make in their life is probably mostly due to them, and nothing I directly did (more like guided). So there isn’t a direct reward or recognition, like you mentioned. That’s why I like to encourage all moms to find something to balance their parenthood with. For some that’s work. For others it could be a few hours to hone a skill or enjoy time to oneself or with friends. Nina, once again you are spot on. I love how you’re not afraid to say the things that need to be said. I work in legal marketing and it’s a very deadline driven profession so can be stressful while I’m at work. While I’m at work is the key phrase. I generally don’t bring my job home with me and for that I am thankful. I couldn’t imagine being an attorney or doctor and working full-time. I greatly admire those who do it but know it’s not something I could or want to try to balance. Thanks, Jenny—I appreciate your words. That’s fantastic you’re able to separate your job from your time at home. I do a good job of doing the same myself. I used to work from home and while 90% of the time it was smooth, there were times when I had to work on something stressful while my kid was around. Can you imagine combining the two?! lol. Ahh, good point Lauren. With parenting, we know we’re pretty much the biggest support system our kids have. Our jobs? It’ll go on fairly okay if we were to quit, but with our kids, the impact would be much deeper. We’re also more invested, I think. They’re our kids, after all. We’re vulnerable to them, just as they are to us. Oh yes! I so agree with this! Weekends are much more exhausting with little kids. I have often wondered to myself if this gets easier when they are grown, and then it occurred to me that they will likely be involved in some sports and activities when they are older. So no, weekends will still likely be busy when they get older! I am blessed to have a low stress job as well, and even more blessed to be able to work from home. The work week actually is easier than the weekends. That is not to say that I don’t enjoy the weekends! But they are tiring. I totally know what you mean about weekends, Marjorie. I definitely enjoyed them more when I didn’t have kids lol. I think it’s because we can’t just relax the whole weekend; we’re still on duty. And you know, I do think it gets easier as they get older. I know even from the time my eldest was a newborn til the time my twins came (basically 3 1/2 years), it was so much better. By the time he was 3 1/2 I could actually take a nap (albeit a light one), read a book, get things done around the house, cook, etc. Then it was all over by the time the twins came lol. Haha I know what you mean Rebecca! I’m home with the kids in the afternoons, so that’s like, four straight hours of them with no breaks. I’m sweating by the time they’re in bed, it’s crazy. While there were a couple days where I worked 18 hour shifts (with one 20 minute lunch break and two other ten minute breaks to pump – just want to stress how ridiculous this job was! ), I would say that staying home is harder. The part that makes it harder – the things you mentioned. Not being able to focus and have a flow. I am constantly being interrupted. So much so, that I have trouble keeping my brain on topic and completing a sentence at the end of the day sometimes. Anyway, thank goodness for Mom’s Night Out once a month! Haha that’s hilarious that the mom groups just talk about kids. Sometimes I feel bad because there’s a group of us at work with kids and some without and I totally feel like the moms take over the conversations with their talks about kids. I guess we need to vent it out somehow! Me, I try not to talk about kids at work unless someone asks. I try not to lose other topics and interests. You’ve really sparked an interesting discussion as always Nina! For me, I think there is a balance. I find being at work stressful sometimes, and I find being at home stressful sometimes too. I work part-time and sometimes after Mushroom has been a monster all weekend I can’t wait to sit at my desk in silence and have a cup of tea. On the other hand, after a busy day meeting deadlines and doing projects I love a bit less, I can’t wait to get home and relax – even though the evenings with Mushroom are not that relaxing! That said, I don’t think I could be a SAHM without losing my mind a bit! Then I would get stressed. I have a good balance at the moment but it’s about to change as I give freelancing a go so we’ll see whether my thoughts change as I start on that new journey! That’s a wonderful way to look at it, Rachael. Both situations definitely have their ups and downs. I love being myself at home too. You can look however you want, you can use the restroom in your own privacy lol, and you’re just more comfortable. I can’t wait to get home too, however difficult the tasks are ahead of me. Of course I’m tired by the end of the day but I’m very fortunate to be able to spend a huge chunk of the day with them in the afternoons. Honestly my ideal balance would be to work part-time. It’d give me a pretty good 50/50 balance. I think that parents of children who have severe developmental difficulties or who are seriously ill do have the hardest job in the world. As a parent of four young, mostly-healthy children, I find the challenge of parenting to be the relentlessness of it rather than it being particularly hard. It’s taken me a few years, but I’ve learned how to experience “flow” with them – by embracing life at a child’s pace and focusing on making memories. I love being a stay-at-home-mom, particularly with blogging as an incredibly flexible very part time job that gives me a creative outlet. For me, this has been a great “fit”. My husband has a much more prestigious career, and he adores it, but – having lived in his world in pre-kids – I think his career would be more challenging for me to embrace than the hours I spend being constantly interrupted by little voices. I don’t think it was ever a question of loving working or staying at home much more than what’s more challenging. There are probably working parents with ridiculously stressed out jobs but still love it like crazy, just as there are stay at home parents who clearly have a difficult job but couldn’t imagine anything else. I’ve actually been reading one of your recent book recommendations, Peaceful Parent, Happy Kids, and have been applying a lot of its messages to my own parenting these last few weeks. I noticed that when I’m more connected and embrace my kids and let them turn to me even with their outbursts, I’m much calmer and they resolve their issues much quicker. This has definitely made my care taking days much easier. I imagine it’s also nice once the kids are older (like some of yours are). I noticed a marked difference between the time my eldest was a young baby to the age he is now. He’s much easier to care for generally than when he was completely dependent on me for everything. See that’s what I thought Lindsey! 🙂 I didn’t even consider the after-hours schedule of working into the evenings. I was more imagining the scenario of standing in front of kids all day long and dealing with their craziness times 18 or 24 kids lol. I really wish it weren’t this way, and some jobs (teachers, doctors, nurses) that shouldn’t be the most sleep-deprived end up being that way. I notice the teachers at my son’s preschool always look so tired, and I think they literally are in the building from 6am to 6pm it’s crazy! I think you are right in that it really depends on what job you have and how many kids you have at home. There are a lot of factors. I used to be a teacher and I worked in a challenging area where I had some explosive kids who would just walk out of the room. One year I had a relatively easy class so the time flew by much more quickly. I’m at home right now and I write SEO articles on the side. I think if I weren’t working at home, I would have more free time. I’ve been a lot more tired this year but maybe that has to do with the fact that I’m getting older. =) Interesting post. Love all the respectful comments on here. Now I think about it, not only does the number of kids matter, but the age too. An eight-year-old and a ten-year-old are much easier to be home with than a one-year-old and a three-year-old! I’m a middle school teacher (special education/behavior/math). Being a mom of three who gets to spend summers at home with my kids, I can say that my job is definitely more difficult than being with them. I teach two year olds who mostly (but not all) turn three throughout the year or in the following summer. 13 of them. For 8 hours a day. There is no comparison, it is more physically, mentally, and emotionally demanding than most other jobs. There can still be coworker drama or boss drama, but on top of that we have to deal constantly with the parents AND the kids. Yesterday I had two subs in my room. I had two bites from the same kid and an attempted bite. I had a little girl stand up on a chair and fall and possibly bump their head (didn’t look like contact but we have to treat it as such). That legitimately means I had to fill out 6 pages of accident reports, and make over a half hour of phone calls to parents as well as taking the kids to the nurse who was nowhere to be found AND talking to the kids. We aren’t even allowed to use time outs or yell. And you know what? You can’t even get mad at the kids, because that does you no good and makes you feel horrible. Like my life was so much easier before my newest student came in, but admitting that our loud makes me feel terrible because she’s a small child. One kid screamed for twenty minutes straight three different times yesterday, right when I’m trying to do a circle time, one kid kept hitting. Three of them just constantly said my name on repeat without taking a breath most of the day and when I said I can’t talk to you right now, sweetie, I’m watching the whole class, that Sad kicked puppy look broke my heart and made me feel terrible about myself. By the time the last few kids go down to sleep after Herculean effort on our parts (those who will actually nap, some don’t at all), the first few are waking up. My Fitbit legitimately tracks diaper and potty time as “Sport” because of the level of exertion. We had parent volunteers come in and watch our classes for an hour and a half for teachers appreciation lunch (during nap after we already fed, changed, put out rest mats, and tucked everyone in), and two parents had to leave it was too much. One parent just keeps saying thank you (now it’s May, better late than never) because she said she could never do it. Physically, mentally, emotionally. And yet we don’t make enough money for me to pay my student loans and car, medical expenses and food and still have enough for housing and utilities. So yeah. This is why I thought of teachers when I was thinking of exceptions to the rule 🙂 I’d likely be one of those parents too who can’t imagine how you do it. It must be so hard to teach students with all these challenges, while trying to be patient and understanding all the same. At my kids’ preschool, they definitely have more hands on deck for the younger age you teach. That two-year-old stage is hard, times 13!